"JOY IS A FORCE OF NATURE." - David A. Foster, Ph.D., Professor of Biology, Hunter College Have you arrived at that day of reckoning when you look in the mirror and find yourself admitting, "I don't like the way I look. I don't like the way I feel. I wish I could start over again " Well, you can. Joy Gross is living proof that when you change your diet and incorporate healthful practices into your life, you will end up looking and feeling brand new. You can revolutionize your entire approach to living. 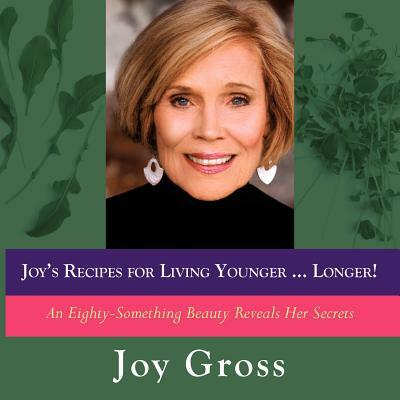 Maybe you'll even take up skydiving at the age of 81, as Joy did "Joy's Recipes for Living Younger ... Longer" is not just another book about the virtues of eating better for health. Joy Gross and her husband, Dr. Robert Gross, co-founded the legendary Pawling Health Manor in upstate New York. Over the course of three decades she demonstrated the effectiveness of the principles she believed in by applying them to more than 60,000 clients. Celebrities from Hollywood to Broadway paid tens of thousands of dollars for the health secrets provided at the Manor. But all of these secrets-and more-are revealed completely in this succinct and powerful book. Delicious recipes show you practical ways to nourish your body and maintain an alkaline inner environment. Joy shows you how to make beautiful nutritious salads, innovative raw and steamed vegetables, and magic green chlorophyll-rich juice and smoothies. You'll put together luscious fruit plates and even yummy desserts. Plant-based meals have never tasted so good Joy's book truly delivers on the promise of its title. If you make the changes she advocates, you will become younger and live younger ... and enjoy a happier, healthier, and more vibrant life. Joy Gross is a health expert and author who has been a pioneer in the field since the 1950s.She has been committed to a "green" diet and lifestyle for 70 years, since she conquered a serious childhood disease through a radical change in eating habits. As director, lecturer, and all around hands-on person at the Manor for over 30 years, her own knowledge and expertise became well honed. She is the author of three previous books: "The 30-Day Way to a Born-Again Body," "Thin Again ," and "The Vegetarian Child." A mother, grandmother, and great-grandmother, Joy lives an active life in Rhinebeck, New York, where she paints, gardens, and jumps out of planes. "Joy always tells me she's proud to have me as her son-in-law. I'm proud to have her as my mother-in-law. My patients from upstate always know who she is " - Hector Rodriguez, M.D., Columbia-Presbyterian Medical Center "Joy Gross is a living testament to the power of eating healthfully. Read, learn, enjoy. "- Laura Pensiero, owner of Gigi Hudson Valley, registered dietitian, and author of "Hudson Valley Mediterranean.